Chuck Taylor was an athlete of the 1920's with enough fame to get a namesake shoe from Converse. 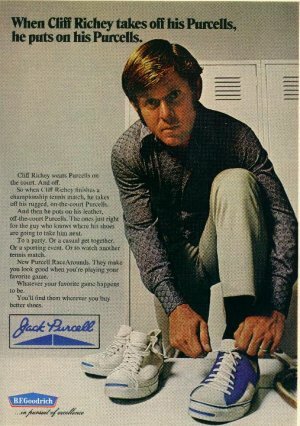 Jack Purcell was an athlete of the 1930's, and he also got the same honor from B. F. Goodrich. B. F. Goodrich, if you remember your Baby Boomer advertising, was the tire company without the blimp. Now, they've quit making tires. They have even dropped the "B.F." from their name. (There are still BFGoodrich tires, but they're not made by the Goodrich Corporation.) What was left of Goodrich was later acquired by United Technologies. In the early 1970's, B. F. Goodrich left the sneaker market, and Converse acquired the rights to make the Jack Purcell sneaker. One of the biggest Jack Purcell questions: "What did Jack Purcell play?" On first guess, many would say tennis. Wrong answer! Jack Purcell earned his fame playing badminton. Another comment about the Jack Purcell shoe: Converse calls the blue rubber that shows around the front the "Smile," along with a unique light blue sole. To me, when you're looking down at a pair of Jack Purcell sneakers on your feet, they look more like a "Frown." This is a Jack Purcell advertisement, back when B. F. Goodrich produced the shoe.